This week, I put on my tactical turtleneck (tactilneck?) and sprinted to the local Red Box to rent Jack Ryan: Shadow Recruit (2014) starring Chris Pine, Keira Knightley, Kevin Costner and Kenneth Branaugh. It's directed by Phil Alden Robinson. 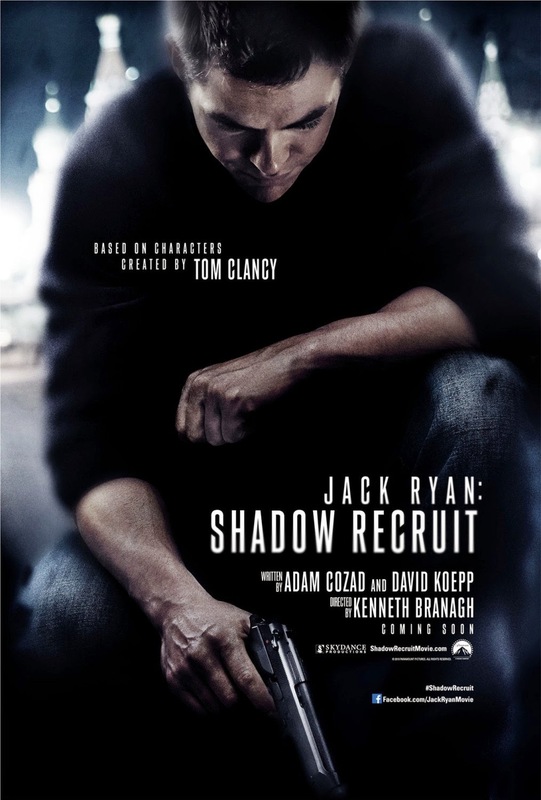 Jack Ryan: Shadow Recruit (2014) is the second attempt at a reboot of the Jack Ryan franchise. The character and the previous movies were based on books by late author Tom Clancy. The original film saw Alec Baldwin playing Jack Ryan opposite Sean Connery in the total 80's guy movie The Hunt for Red October (1990). Harrison Ford then took up the role for two films [Patriot Games (1992) and Clear and Present Danger (1994)], then Ben Affleck had a crack at the first reboot opposite Morgan Freeman in The Sum of All Fears (2002). The one thing all these previous films in this loose franchise have had in common is that they were all based on actual works by Tom Clancy. This film, however, is an "original" story inspired by the characters created by Clancy. This may explain why this movie is such a mess story-wise. First, though, let me touch on the title. It's terrible. I'm not sure what they were going for here, but it just doesn't fly. Had it just been the protagonists' name, like the Tom Cruise led Jack Reacher (2012), I think that would've worked. Or, barring that, they could've come up with a title that had something to do with the plot of the movie. Shadow Recruit is, in fact, a plot point of the film, but it's not a great title for a movie. It's like the studio didn't think the audience would get that this is both a Jack Ryan movie AND a reboot showing his initial recruitment into the CIA. The film itself is just a hot mess of action beats and prolonged exposition. It's a shame too as all the pieces are there for a great film. Chris Pine does a good job with the Jack Ryan role and is at his actiony best. Kevin Costner turns in a nuanced performance as Ryan's recruiter and mentor. Keira Knightley is very believable as Ryan's very confused and understandably upset girlfriend. She even manages to get thrown into the high speed hijinks late in the movie. Branaugh is fantastic as the Russian baddie. He's not all popcorny and over the top. More of a suppressed rage just on the edge of bubbling to the surface but never quite getting there. No, the people and places are fantastic. It's the story that's bad. Bear with me while I try to sum this up for you. You get to see Ryan in the initial helicopter accident that ousted him from the marines and landed him at a desk at the CIA as detailed in The Hunt for Red October (1990). He ends up doing covert work within banking institutions attempting to track down illicit funds to ensure they're not being used to fund terrorist activity in a post 9/11 world. When he stumbles across said funds, he heads to Russia to investigate. While there, he seems to uncover a plot by Branaugh's character that will somehow totally collapse the US economy, all while making sure Mother Russia has plausible deniability. This leads Ryan to some cloak and dagger antics involving security codes and stolen files. I'm still not clear on how one man was going to be able to wreck the US economy all from a desk in Russia, but I'll let that slide. Where it gets needlessly complex and borderline silly is the two subplots within. The first involves Branaugh's son, who was thought to have been killed many years ago but is really a sleeper agent within the US. You get introduced to this son fairly early in the movie and you get to see him do some pretty bad things, but it's only in the last 30 minutes of the film that you get to find out who he actually is. Until then, he's just some random guy that seems to have a knife fetish. On top of that, apparently ruining the economy with buy and sell options on US currency wasn't enough, the sleeper son is also going to detonate a bomb from the back of a van underneath a specific road on Wall Street that will collapse 7 skyscrapers. Thwarted (spoiler, sorry), this explosion that never happens also somehow prevents Branaugh from carrying out his nefarious currency scheme, even though Ryan, during one of the long-winded exposition pieces, didn't indicate a bomb would have to go off for this plan to work at destroying the US greenback. If you had a hard time following that last paragraph, imagine how I felt trying to follow it all in the movie. This film starts out with hope and promise. It ends up being a mess of terrible story telling and gaping plot holes. It seems the Jack Ryan franchise will be needing another reboot some time in the years to come. Or any two of the above might work. may not have been that original, but it still proved to be entertaining.